Drift did not curate this email with the intention of creating an eye-catching marketing asset. This is a simple text email that is personalized but transparent. 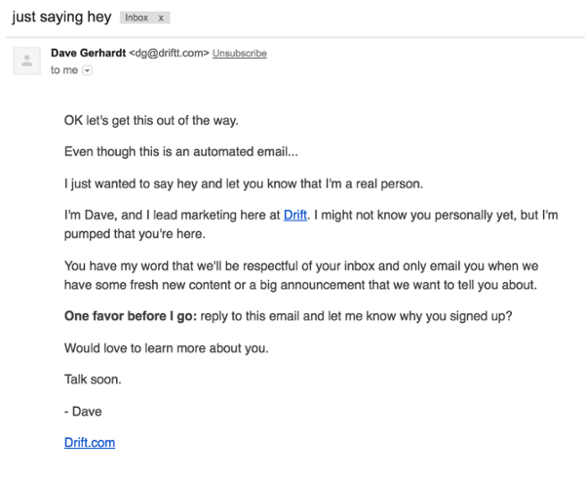 You’re not fooling anyone into thinking your automated emails were individually crafted by a member of your team, and Drift comes right out and acknowledges it. 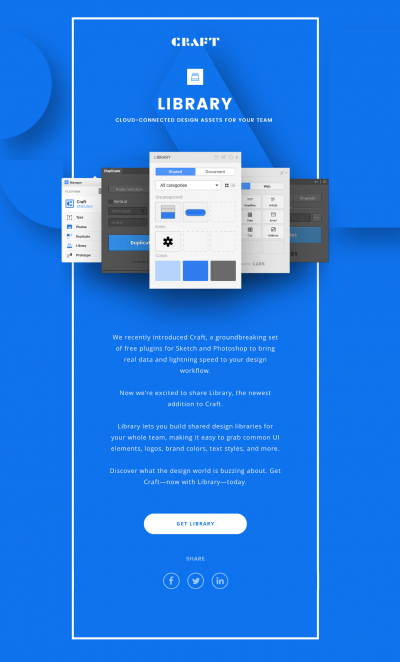 Through a combination of automated personalized content and transparency, the team at Drift presents themselves as friends who seek to provide tailored assistance via their messaging software. Grammarly demonstrates the value of their service, in perhaps the simplest of ways. The company, known for its AI-powered grammar tool uses customer testimonies as the foundation for its marketing campaigns and their emails are no exception. 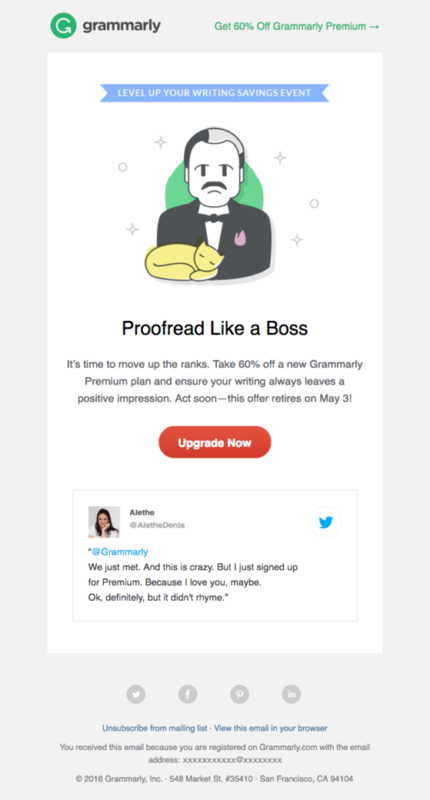 In this email template, Grammarly embeds a customer Twitter testimony and lets a satisfied customer speak on behalf of the company. The lighthearted nature of the testimony itself lends to its authenticity presenting a memorable and reliable opinion about the product in question. In contrast to the single call-to-action strategy, you may not know what your prospects want yet. Creating the opportunity for choice can become your strategy for identifying prospect interests. Lumi takes advantage of this method by embedding links and pieces of their blog content so that prospects can decide what they think is relevant. Navigation based on relevancy ensures that your prospects are accessing the kind of information they need and provides your team with insights through traceable links in your emails. Not all of your marketing emails need to promote your products or services. You can use thought leadership to nurture your accounts and build trust with your prospects. Adweek does so by keeping their prospects informed of upcoming webinars. The call to action in this email is not intended to gain more subscribers directly. 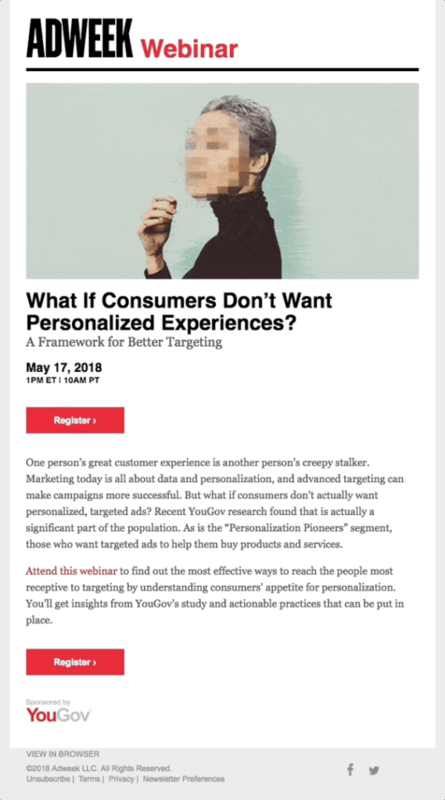 Offering this webinar allows Adweek to demonstrate their ability to effectively communicate information with their prospects which later encourages these prospects to subscribe. Inactive prospects are not necessarily lost opportunities. Campaign Monitor uses a re-engagement campaign to keep growing their business without the need for collecting entirely new emails. As inboxes continue to be filled with more and more marketing content, the value of each of your contacts continues to grow. Don’t miss out on re-engaging with prospects who are already in your database. Instead, provide new and relevant content to address their needs or interests. Now that you have some email template inspiration, you’ll need to decide which model best suits your business goals. Fortunately for you, you don’t have to restrict your template to just one of these 7 concepts. Just as you have seen overlap between these templates, any combination of these template tactics can be used to elevate your email marketing strategy. Our team at Corrao Group can assist you in achieving these goals from Pardot HTML email template creation, to a start to finish marketing strategy. A successful email campaign relies on more than just your email templates. From the best B2B subject lines to learning your way around Pardot HTML email templates, we’ve got you covered. Corrao Group can help your team identify the best email strategy for your unique goals. Explore our digital marketing services here.